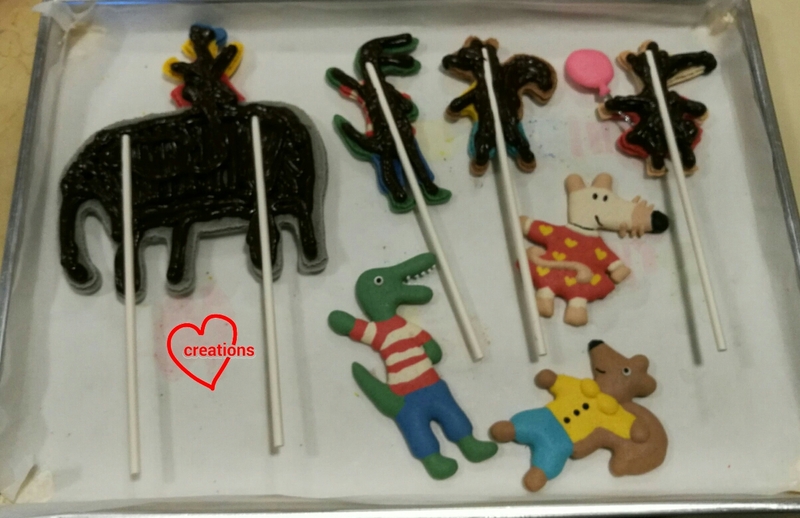 This is the second in my series of "Edible toys" cookie bakes for parent and child to participate. 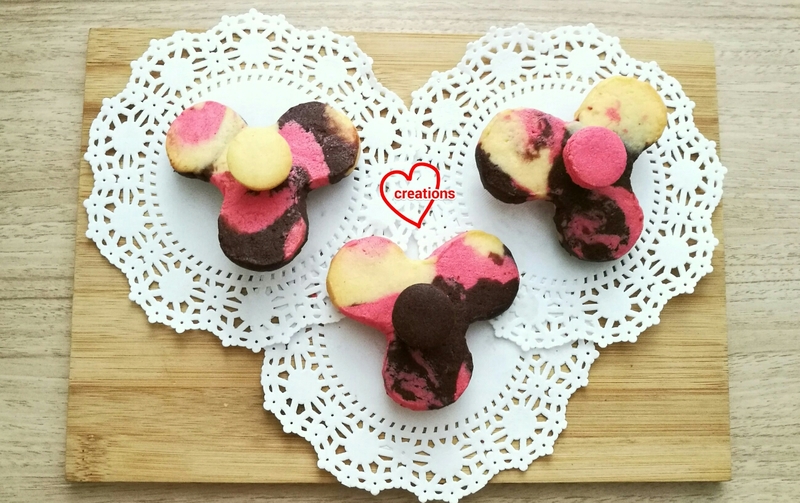 Fidget spinner cookies that you can play with and eat! No artificial colours are added as far as possible in this bake. 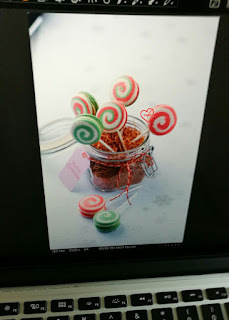 The Neapolitan flavours -- vanilla, strawberry and chocolate are the ones that will colour the cookie. In this class you will learn how to marble a cookie dough and assemble an edible fidget spinner. Please click on this link to register if you are interested. Do you like the orange slices baked into the top or the sides of the cake? So happy my experiment worked! 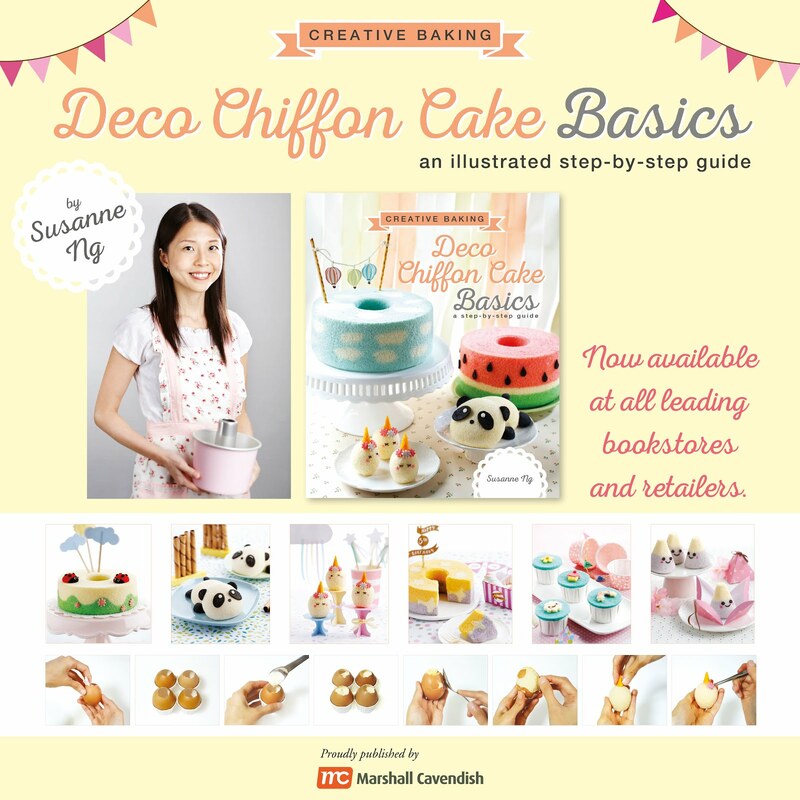 I first baked Mandarin oranges into chiffon cake 4+ years back. 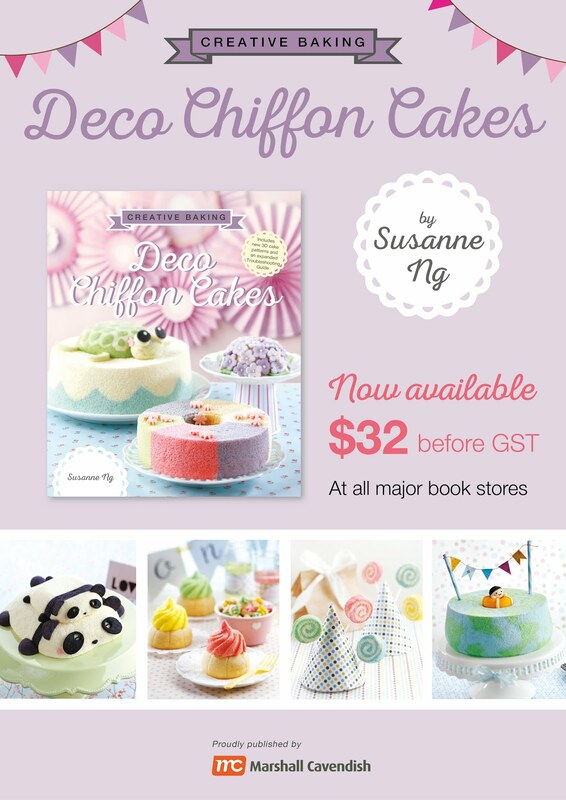 The 'Ji' chiffon cake is now in my 2nd book Deco Chiffon Cakes (without the baked oranges). The orange slices were a little sunken and not so pretty. Glad to finally come back to this and able to bake it both into the base and sides of the chiffon cake with minimal shrinkage! 1. Slice about 4-8 thin slices of oranges from the middle part of the orange (if you want similar sized slices), depending on whether you want to bake it into the base or the sides as well, and also the size of your pan. 2. Place the orange slices into a pan and cover with water. Add 25g of sugar and simmer at low heat for around 15 min. 3. 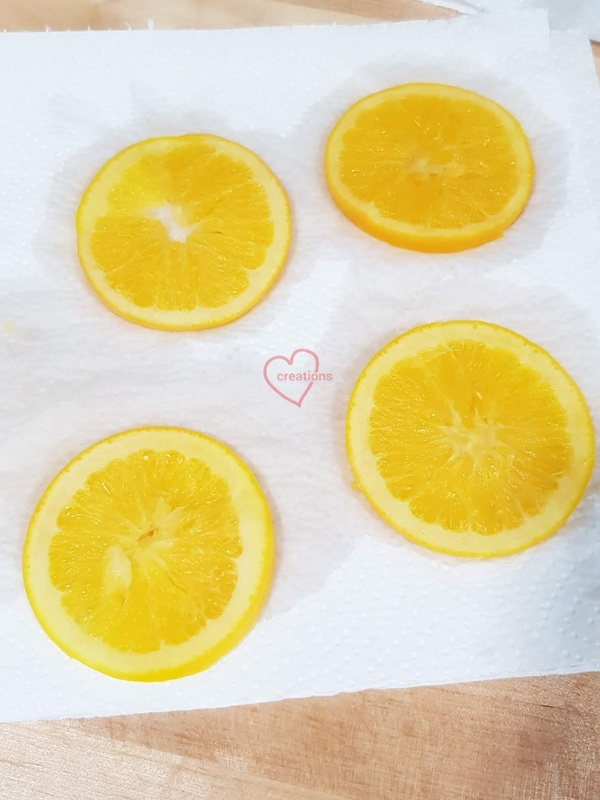 Remove to cool and pat dry the orange slices on kitchen towels. 4. Arrange the orange slices onto the base and sides of the pan. You should stagger the slices at the sides so that they are touching the pan base where there are no oranges. Do not overload your chiffon cake with too many slices as well as chiffon is very soft and needs place to cling. 5. Preheat oven to 160°C. 6. 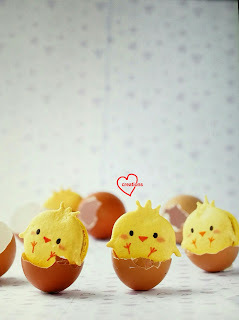 Beat egg yolks with sugar with whisk till pale and light before stirring in oil and orange juice. 7. Next add in sieved flour, orange zest and a few drops of orange emulco (optional) and whisk till no trace of flour is found. 8. Meringue: Beat the egg whites with ¼ tsp cream of tartar till firm peaks, mixing in caster sugar in 2 additions. 9. Fold in the meringue gently into the batter 1/3 at a time. 10. Gently tap the tin on counter top, while holding the tube firmly, to remove air bubbles. 11. Bake the cake for 15 min at 160°C, 10 min at 150°C, then 30+ min at 140°C. Or until a bamboo skewer inserted into centre of cake comes out clean. 12. Invert immediately once out of the oven to cool. 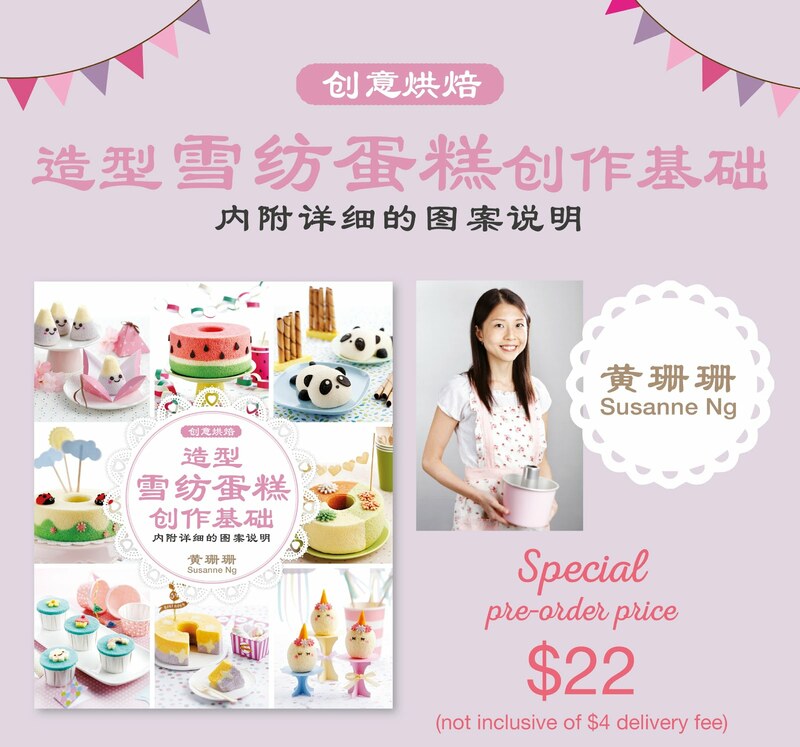 13 Unmould by hand (video tutorial) after the cake is cooled completely. 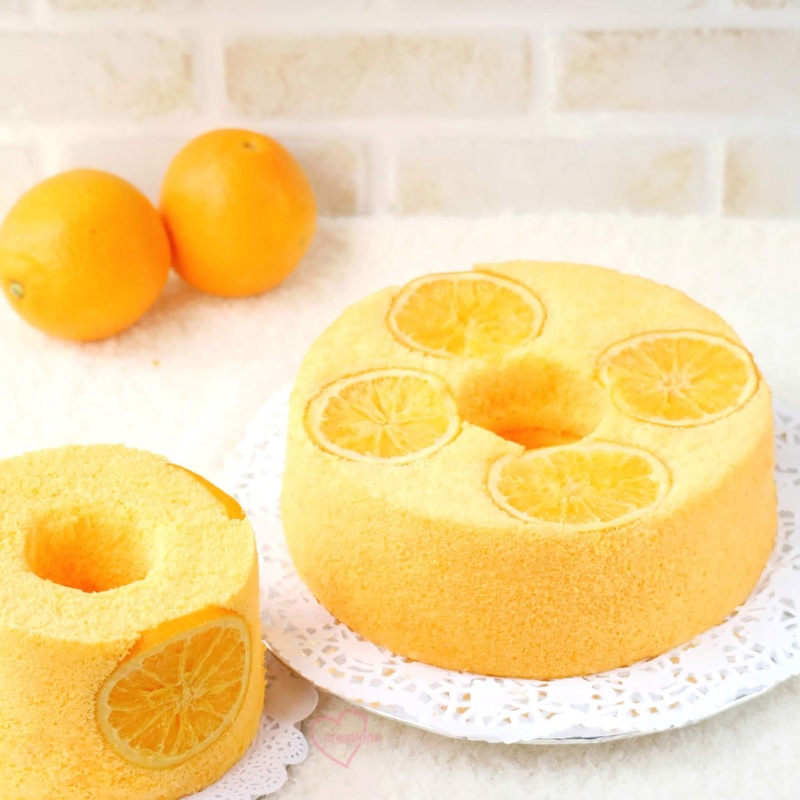 Hope you enjoy making and eating these yummy baked orange slices orange chiffon cake! Reviews for the cake was very good in both taste and texture! 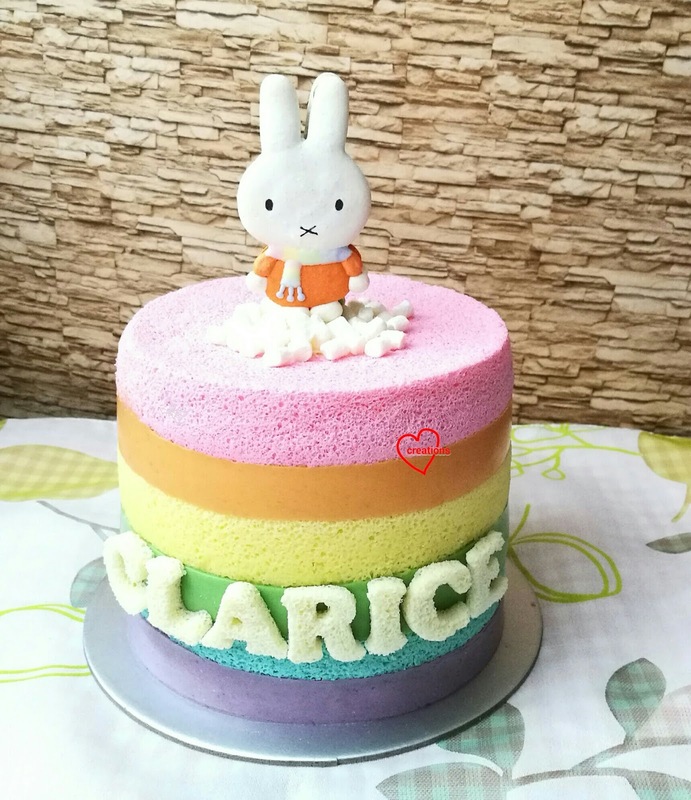 My friend's daughter is a big fan of Miffy so she requested for a few Miffy macaron cake toppers which she can use over a few birthday celebrations for the little girl, and one rainbow sponge and pudding cake topped with one of the cake toppers I made! You may refer to my previous post for the detailed recipe for Miffy macarons. You may fill it with fillings of your choice. 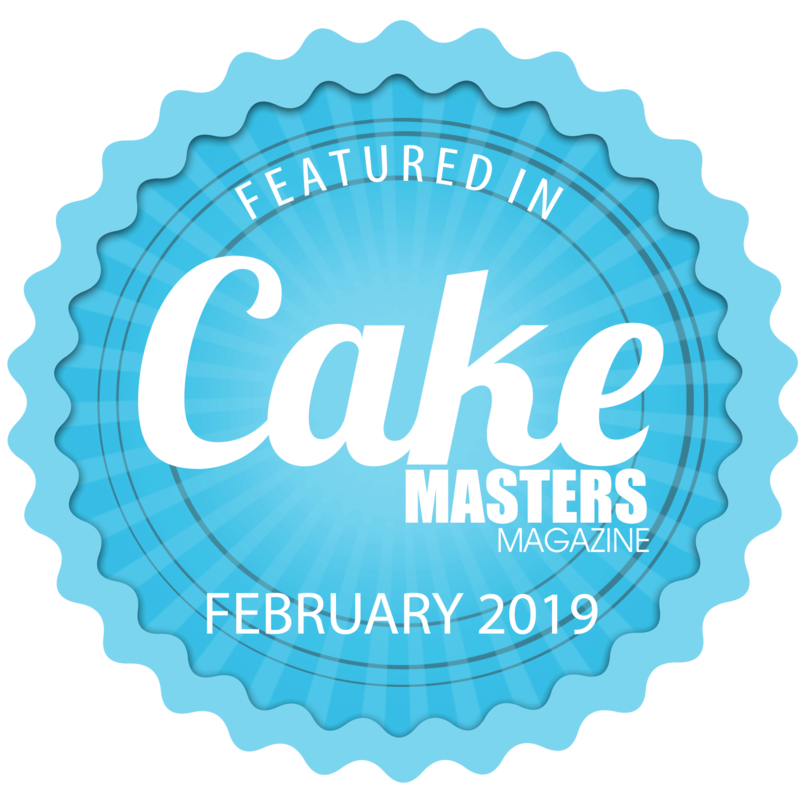 I will focus on sharing the recipe for the cake in this post. I used a reduced egg yolk chiffon cake recipe in order to get a nice blue and pink sponge without adding too much colouring. The great thing about sponge and pudding cakes is the pudding keeps the sponge moist during storage and the complentary textures of soft fluffy chiffon and smooth pudding is really nice. 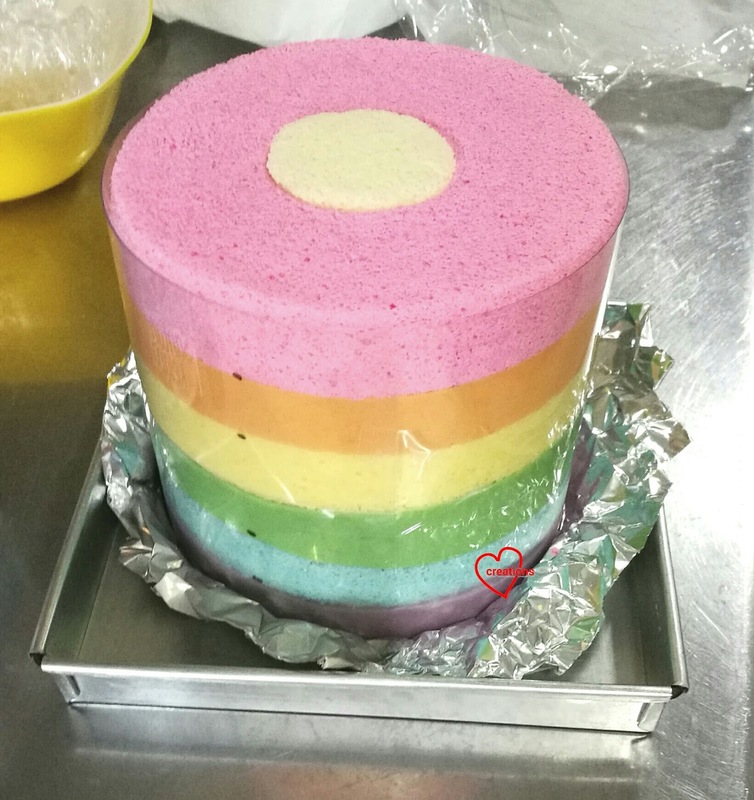 Note, you can choose to bake all colours at once then slice horizontally to separate the different coloured layers or bake them individually in three rounds of baking. I baked the colours individually as I didn't want to have the stress of ensuring all layers are perfectly level and then slicing them in perfect layers. I baked each layer for about 30-35 minutes. You may also bake the cake or cakes in regular 15cm round pans with the base lined with parchment paper. 1. Preheat oven to 150℃ and set oven rack to lowest or second lowest position. You may choose to place a tray of water at base of oven to create steam but this is optional. Increase baking time if using steam baking. 2. Prepare egg yolk batter. Whisk egg yolk with castor sugar until pale and thick. Add oil and whisk until combined. Add coconut milk and flavourings until combined. Gradually sift in flour and salt and whisk until no trace of flour is seen. Divide the batter and add colouring as desired. 3. Prepare the meringue. 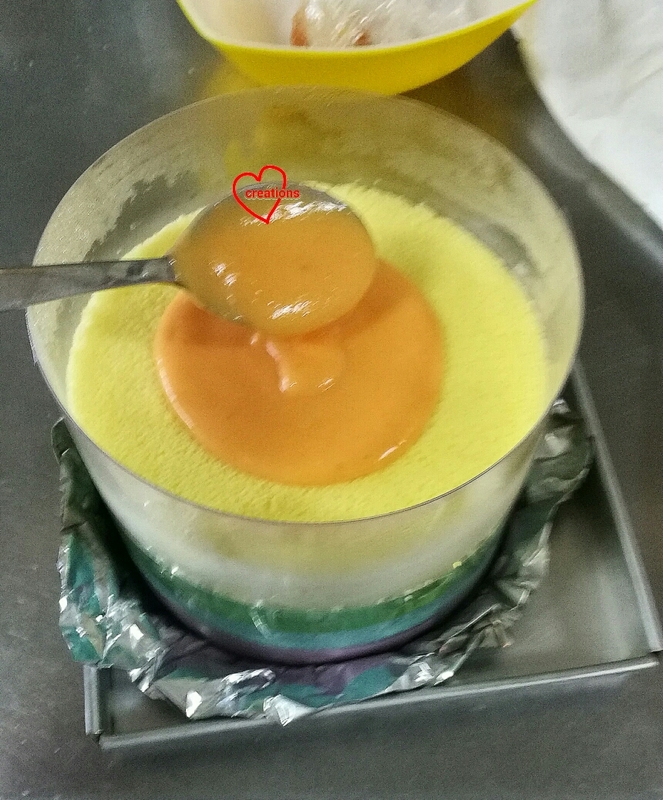 In a clean metal bowl, beat egg whites with cream of tartar until firm peaks form or stiff peak is just reached, gradually adding sugar once the egg whites are foamy. 4. Quickly but gently fold the meringue into the egg yolk batter in two additions. Pour or spoon batter into chiffon tin/ baking pan. 5. Bake for 10 minutes. Reduce temperature to 130℃ and bake for another 15-20 min if you are baking single colour at a time. 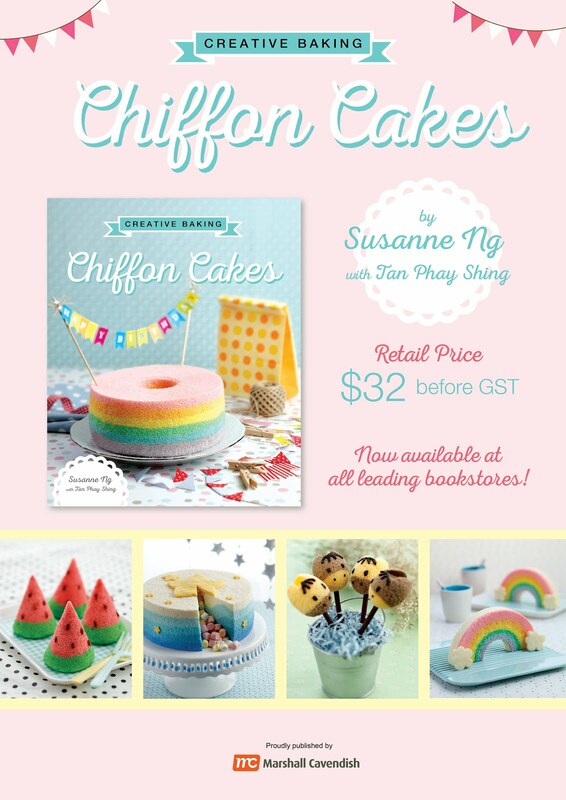 If you are baking a full chiffon cake, extend baking time for another 15-20 min or so. Do note that temperature and time suggested here is just a reference. Each oven behaves differently so adjust accordingly. Always use an oven thermometer at all times. Cake is done when a skewer inserted comes out clean. 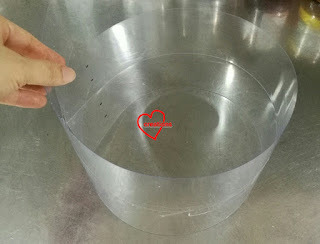 Invert chiffon tin (if using one) to cool completely before unmoulding by hand. Store the layers in cling wrap to prevent drying out. 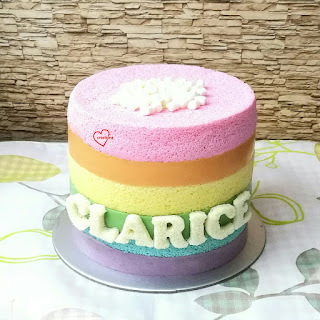 I baked extra chiffon sheet cakes to fill the hole in the middle and for the name on the cake. I cut out circles from the sheet cake for filling the holes. I make use of the natural colours of different types of sweet potatoes to create the rainbow pudding layers. Here are the steamed and mashed sweet potatoes! 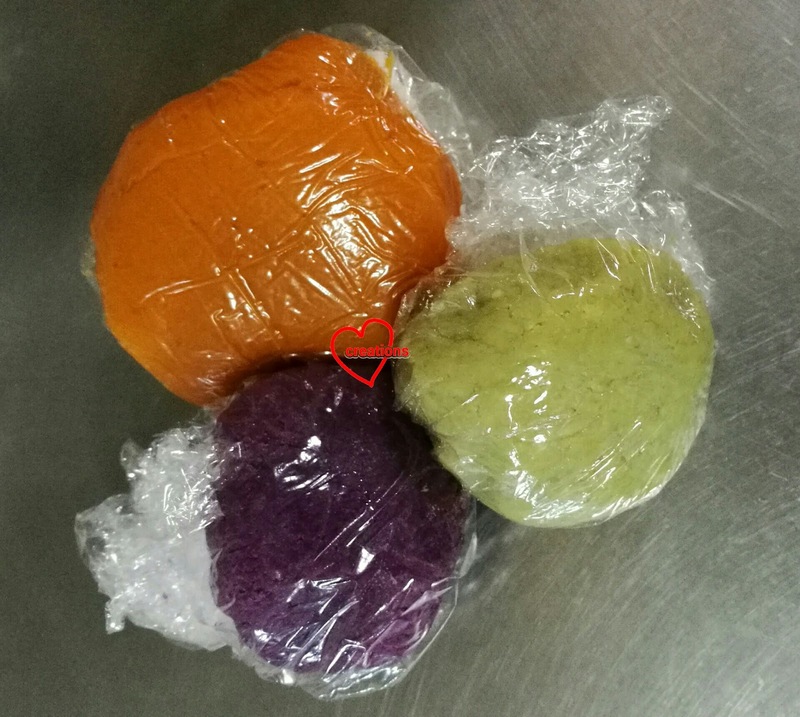 Steamed and mashed orange, Japanese and purple sweet potatoes. 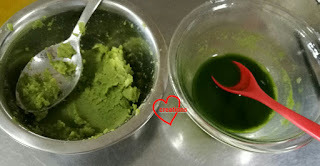 I prepared some pandan juice that has been kept in the fridge for two days to become more concentrated, and added some to the Japanese sweet potato to colour it green. As you can see the colour is rather dull. I still needed to add 1/4 tsp pandan paste to make the green more vibrant. I added 2 drops of liquid orange colouring to orange sweet potato as the natural colour is a little light when mixed with coconut milk. A key to creating such layered sponge and pudding cakes is to carefully prepare the flexible plastic cake ring. 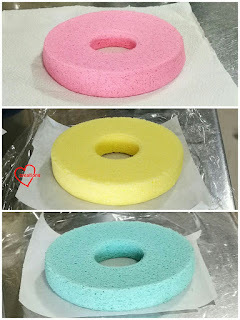 I have tried using springform pan and adjustable metal cake rings before to assemble sponge and pudding cakes. 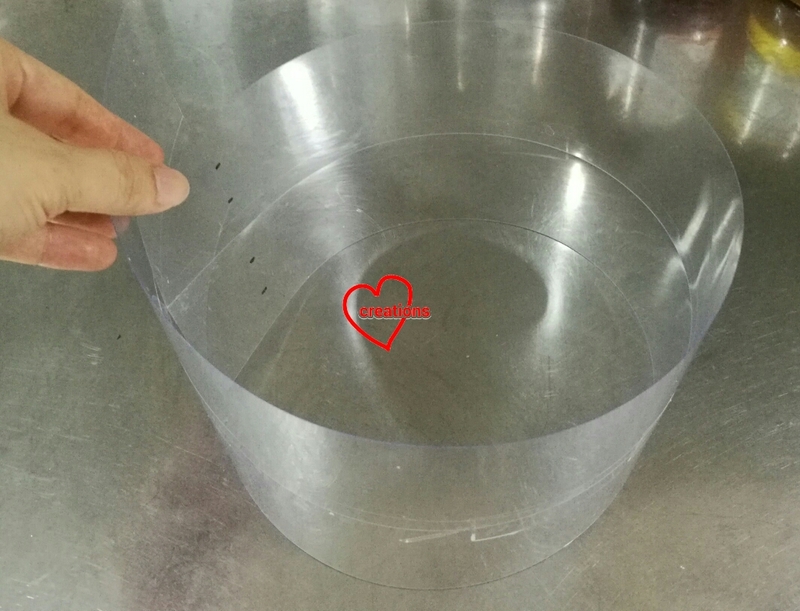 But I find using clear flexible plastic cake rings the best option as it is versatile in the sense that it can be adapted for different cake diameter and height. 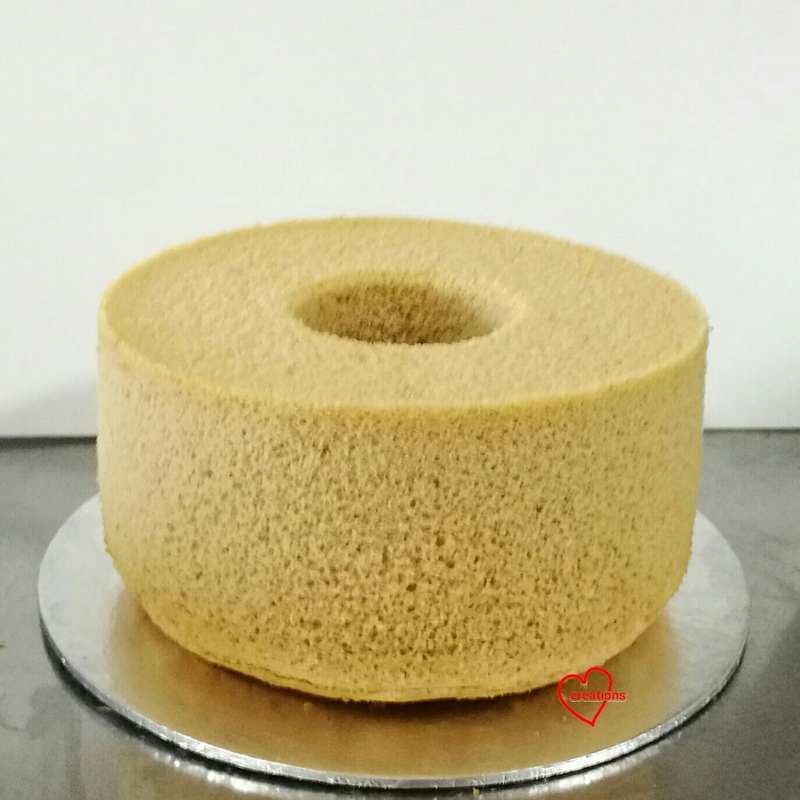 As the sponge layers are about 2-2.5cm tall, the pudding layers have to be about that height. I carefully stuck two strips of plastic together using scotch tape to form a taller wall. I also used a marker to make little dots to mark out 2cm intervals along the height so I know how much pudding to fill during assembly. Measure out the circumference of the cake ring needed using a layer of baked sponge cake and tape the ring. The sweet potato pudding recipe below is for one layer of pudding. 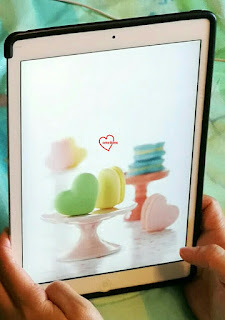 You need to prepare three portions for all three colours. 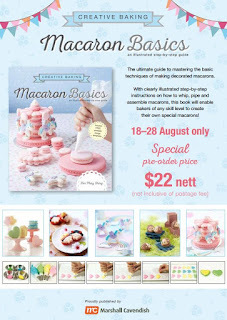 Recipe is adapted from here. 1. Combine A) in a saucepan. Mix B) in a bowl and set aside. Mix C) in a jug and set aside. 2. Bring A) to boil while stirring, making sure all agar has dissolved before adding B) to A). Bring to boil again while stirring. 3. Stir C) again before pouring into contents in the saucepan. The mixture will thicken suddenly. Just remove from heat for a while and stir vigorously. Put back on heat and stir for another minute. Strain the mixture through a sieve to remove any lumps. Note that you should prepare one pudding layer at a time and assemble one pudding and sponge layer at a time. 1. Place cake ring on a sheet of aluminum foil with sides folded up. 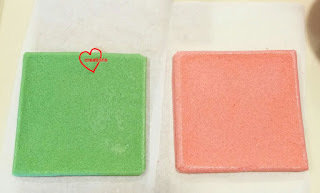 You don't need the foil if you are assembling sponge layer first and you can assemble directly on the cakeboard. 2. 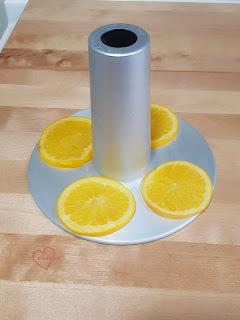 Place a piece of circle cutout on top of the foil in the middle.of the cake ring. This is necessary as the cake will slide off the cakeboard easily if there is no sponge to anchor the cake to the cakeboard. Spoon some purple sweet potato pudding to cover the sponge cake. When you have filled about 2cm height worth of pudding, place the blue sponge on top carefully and gently press in down. 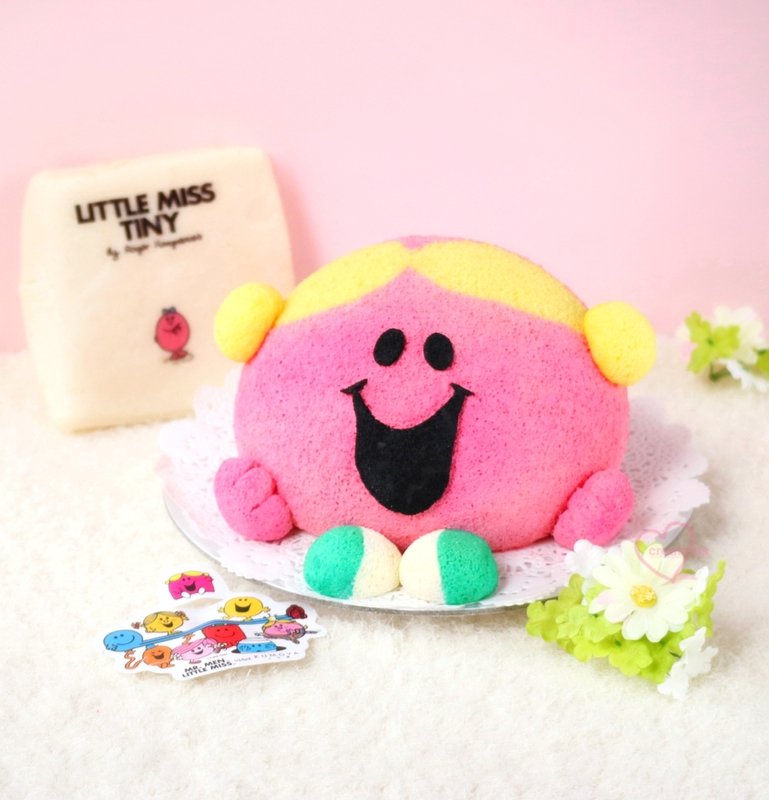 Fill the hole in the sponge with a other circle cutout cake. 3. Chill the cake in fridge while you prepare the green pudding. Repeat layering of pudding and yellow sponge. Repeat for orange pudding and pink sponge. 4. Cover the top of the cake with cling wrap to prevent the sponge from drying out. Chill for at least two hours before attempting to move the cake to the cakeboard. Carefully remove cake ring when cake is carefully positioned onto cakeboard. I just used simple deco for the cake with marshmellows and the name in cream coloured sponge. 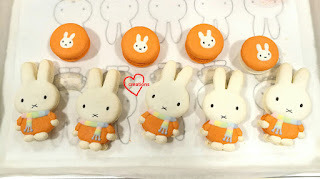 Not forgetting topping it off with Miffy! My friend sent me some lovely pictures of the cut cross section. 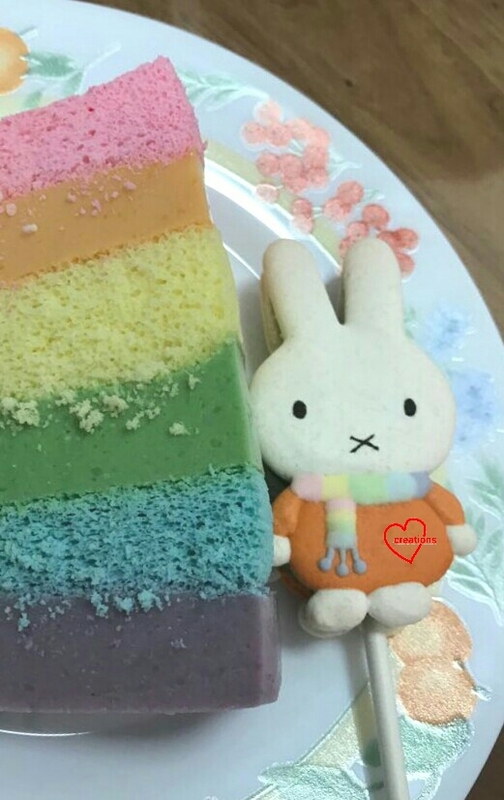 Here's a slice with Miffy too! This is actually Dale from Chip n Dale! 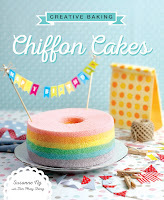 But it was so weird to call it a Dale Chiffon Cake hehe. So here goes! 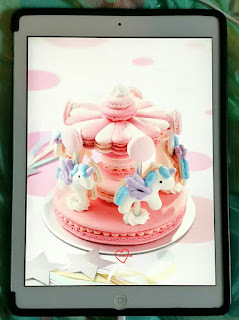 I am loving my little cute square chiffon tube pan from Japan which I also used for my Spongebob cake! Here I made some simple zigzag grass using vanilla and pandan batter. 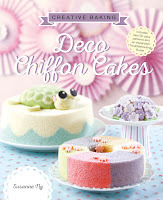 It's similar to my Waves chiffon cake from Deco Chiffon Cake Basics. You can refer to the book for picture tutorials. Here I just made the arcs more pointed to create a slightly different design =). 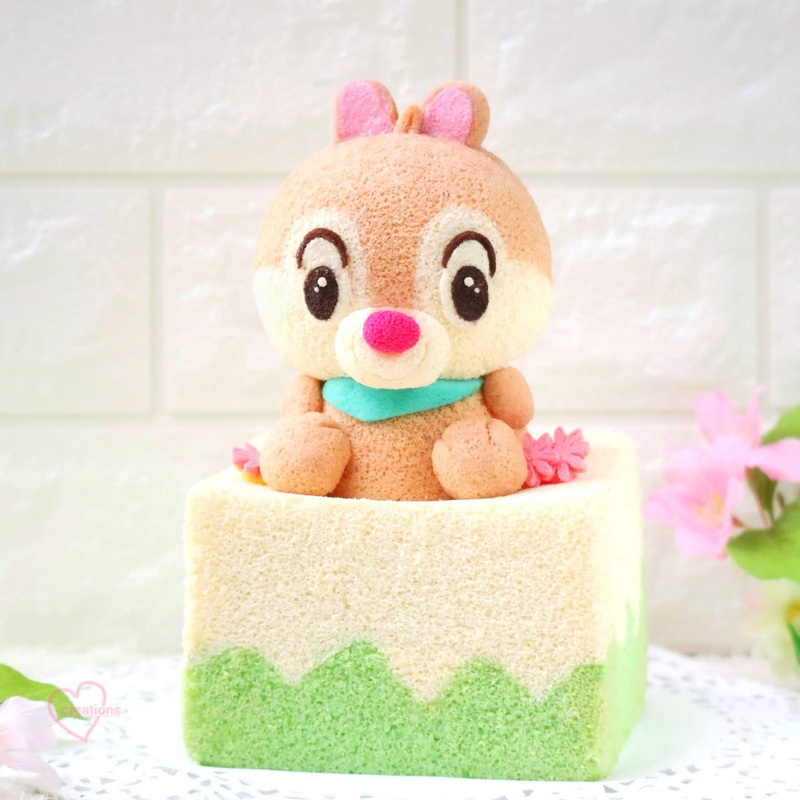 This cake is actually rather similar to my Guji Guji cake which I made previously, including the cute animal on top! 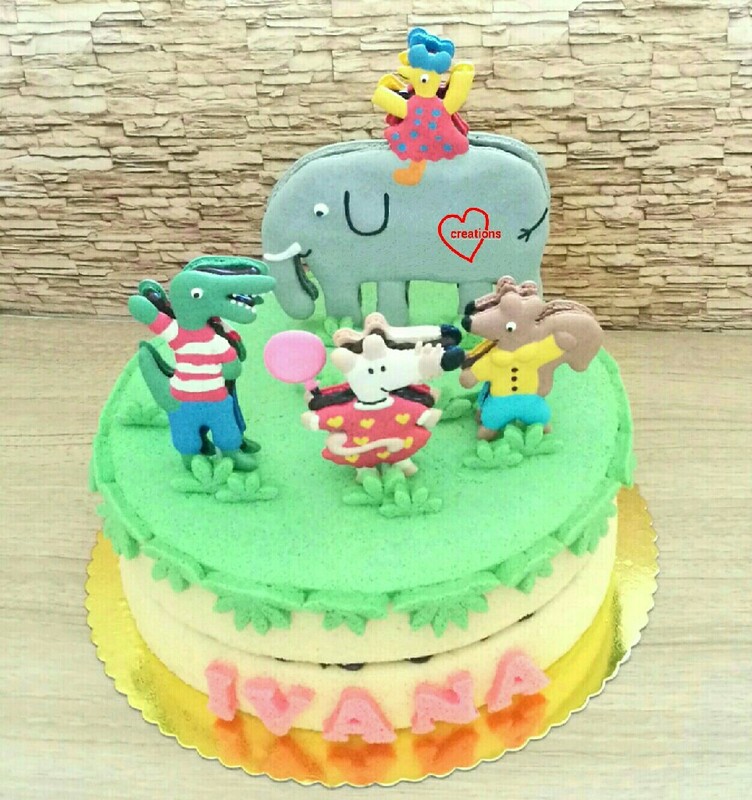 I am always very thankful when my cakes make people smile, so really thank God it did =). Psst.. do you prefer day (below) or night (top)? 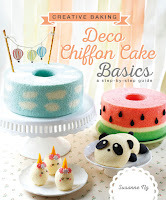 For more picture tutorials and cute animals on Deco Chiffon Cakes, you can refer to my cookbooks! 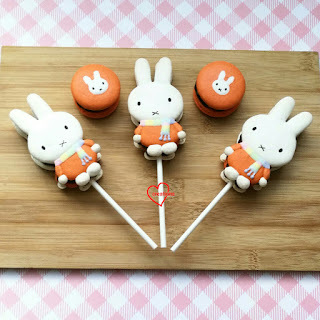 The round macs with little Miffy heads were made with extra batter. 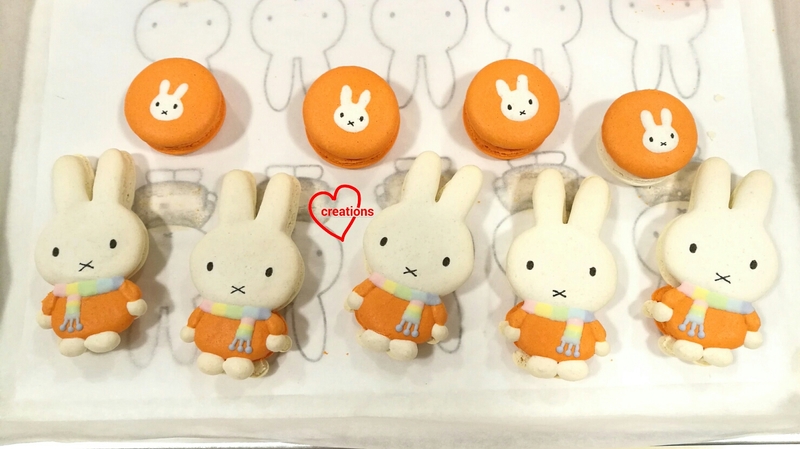 I usually prefer the Italian method for making character macarons as it is easier to adjust the colouring. 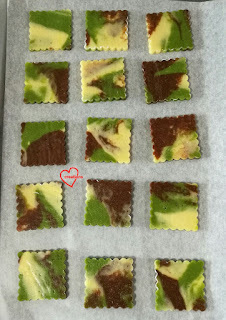 But because this batch is so small, I decided to use French method. The recipe is a little different from what I normally use as I would like to keep the white colour on the shell whiter without adding too much white colouring. I replaced 20% of almond with rice flour and a bit of cornflour. You may replace the rice flour with almond in the recipe below if you find it too troublesome to include another ingredient. 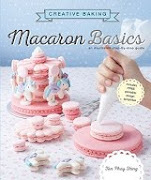 You may refer to my video tutorial for the basics of French method over here. 1. Sift together all powdered ingredients. Divide into two equal portions. Add white powder into one portion. 2. In a clean metal bowl, beat egg whites with cream of tartar until stiff peaks form, gradually adding sugar. Divide into two equal portions. Add orange food colouring to one portion. 3. Add half of sifted ingredients into meringue for the respective colours. And gently fold in. Add the second half of the powdered ingredients and gently fold until combined. Deflate the batter with spatula against sides of bowl until consistency is like lava (please see video tutorial). 4. Transfer both coloured batter into piping bags fitted with a Wilton #7 round tip. 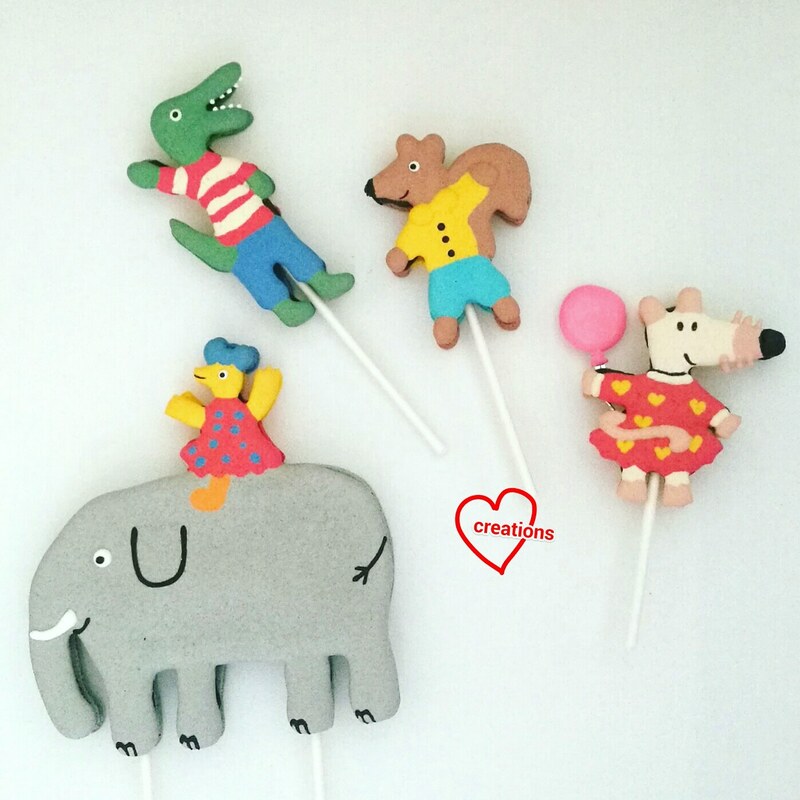 Pipe the Miffys! 5. Bang the tray on the table to release trapped air. I piped the parts in stages to create some definition between boundaries. Dry in air-con room or under a fan until surface is dry to touch. 6. 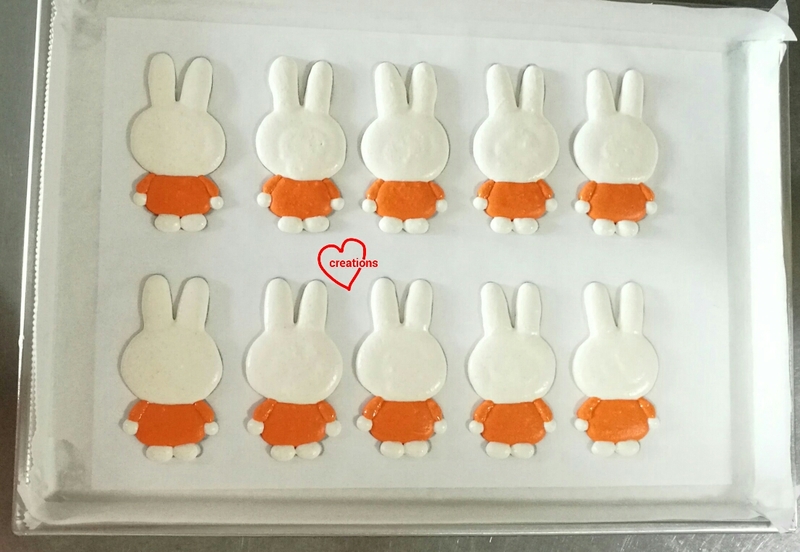 Towards end of drying time, preheat oven to 150℃ and set the rack to lowest position. 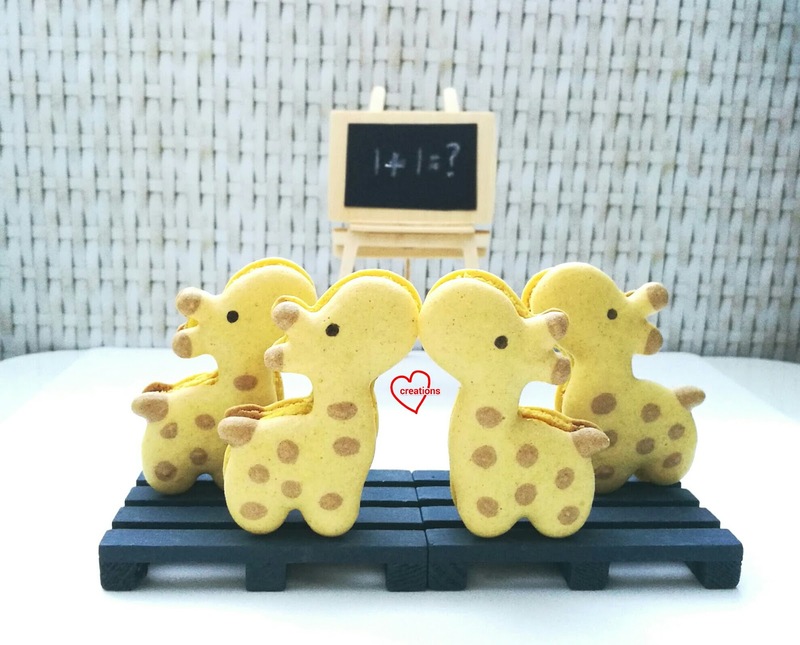 Bake 7 min and reduce temperature to 110℃. The oven temperature will gradually fall. Bake for another 15-20 minutes or until feet doesn't appear wet. Cool completely on tray before peeling parchment paper away from macaron shells. I drew the eyes and mouth with black edible marker and iced the rainbow scarf with royal icing. Jam in piping bag, ready to fill! 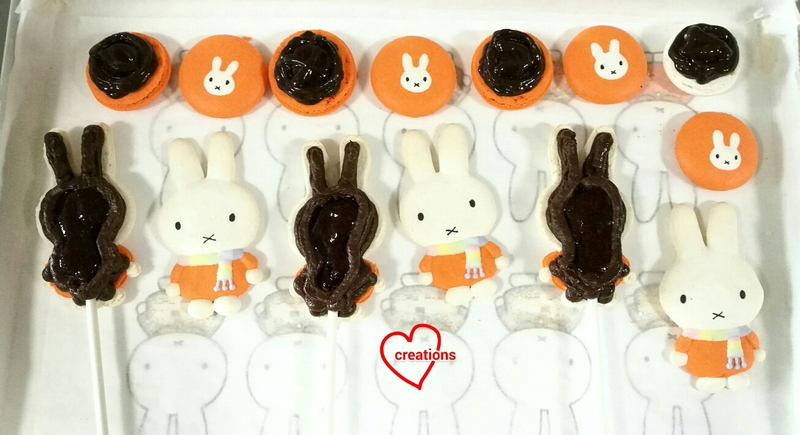 I made a rather firm dark chocolate ganache as the full body Miffys are supposed to be cake toppers. 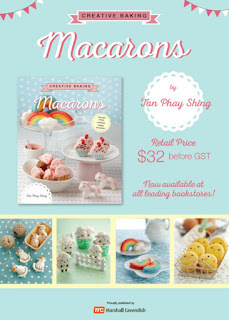 You don't want the macaron shells to start sliding halfway through display. You may refer to this recipe for the dark chocolate ganache but reduce the amount of cream to 25g. 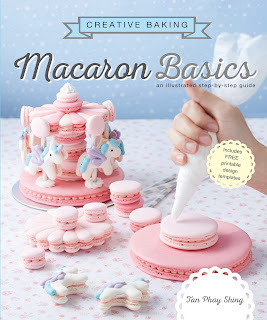 You may include some stabilized whipped dairy cream into the filling to make it truly a blackforest macaron. It will definitely be really delicious! I was making the Miffys mainly as cake toppers so I had to make sure that overall the filling is still firm enough so I didn't include the cream. 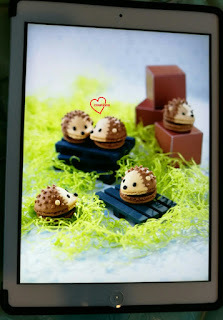 As it was, these were really well received in looks and taste according to my friend :). Stay tuned for my next blog post with one of the Miffys on top of a coconut sweet potato rainbow chiffon sponge and pudding cake! 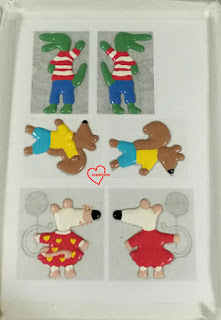 My kids love 'We Bare Bears' and meringues, so I made these for them. They loved these ‘We Bare Bears’ meringue kisses very much, especially the chocolate version. I used cocoa and charcoal powder for the brown and black colours. 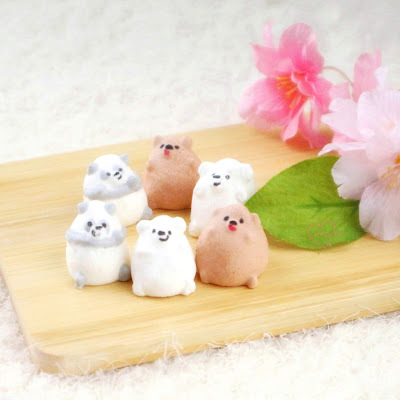 The recipe is adapted from Two Bites Kitchen into my 'We Bare Bears' meringues. 1. Make sugar syrup by dissolving castor sugar in water under low heat. Keep stirring under the low heat for a few mins till fully dissolved. 2. Whip egg whites with sugar syrup above using an electric mixer till stiff peaks. 3. Mix in icing sugar using the mixer. 4. Divide the batter into 3. Mix in the respective colored powder (cocoa and charcoal), leaving the last plain. *I didn’t take note of how much I added. Just pinch by pinch till I get the desired colour. 5. Transfer the batter into piping bags. For each colour, I had a large tip for piping the body, and a smaller tip for the fine features. Pipe the body first on the parchment paper, followed by the features. 7. Allow to cool and remove from the parchment paper. A little sweet for me, but my kids really loved them. Hope you liked them too! Someone saw the "basket of flowers" I made for my mum's birthday more than three years ago and wanted one for her birthday so I made this as requested 😊. 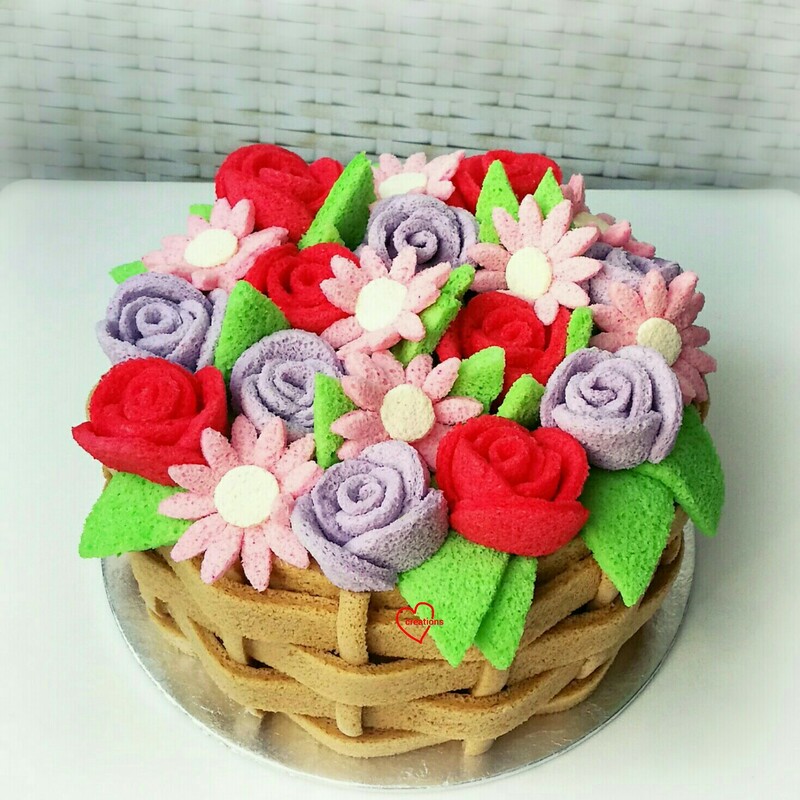 She chose the colours of the flowers and flavour of cake. The layer cakes I baked for the flowers are mildly flavoured with vanilla and coconut. 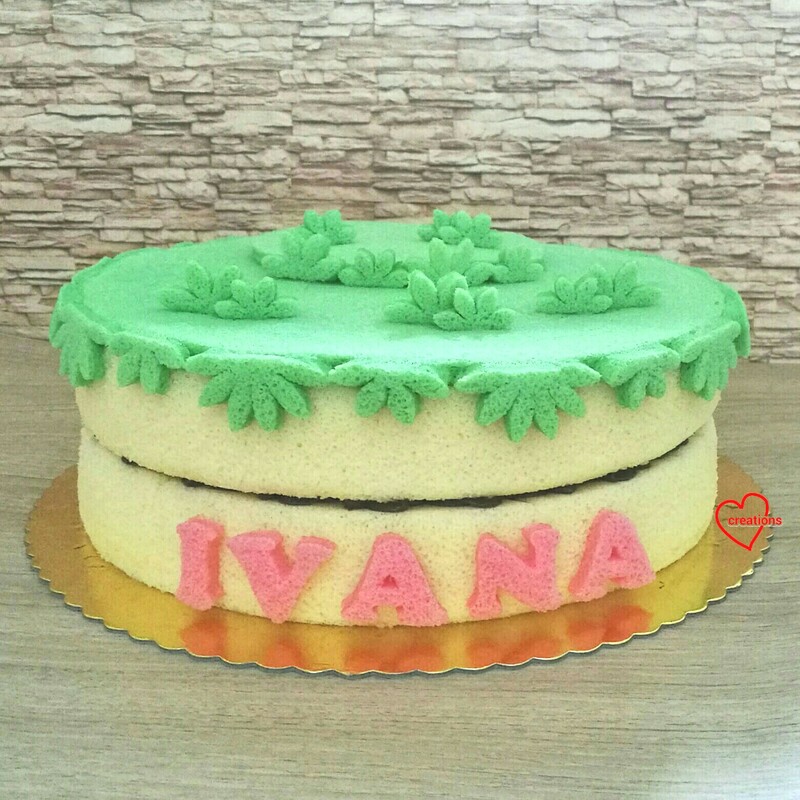 I added pandan paste to colour the leaves green. The recipe for coconut Gula Melaka chiffon cake is adapted from my coconut Gula Melaka Ah Mah cake recipe. I increased the flour content and reduced the coconut milk content to make the cake firmer as it has to support the weight of the flowers. Even then, the flour to liquid ratio is still about 0.71, which is about the ratio I use for baking chiffon cakes in chiffon tins. 1. Preheat oven to 150℃. Set oven rack to lowest position. Place a tray of water at base of oven (optional). 2. Prepare egg yolk batter. Sift flour into a mixing bowl. Heat oil in a small saucepan until 70℃ or until you are able to see swirl lines appearing in the oil. Pour into bowl of flour. Whisk until well combined. Gradually add coconut milk with salt dissolved in it and whisk until a thick paste forms. Add one egg yolk at a time and whisk until well combined. 3. Prepare meringue. In a clean metal bowl, beat egg whites with cream of tartar until firm peaks form or just reaching stiff peaks, gradually adding in sugar once the egg whites are foamy. 4. Add a third of the meringue into egg yolk batter and mix well. Pour the mixture into the meringue and quickly but gently fold until no trace of meringue is seen. 5. Pour batter into chiffon tin until batter is about 2cm away from the rim. Gently tap the tin on the table to release trapped air bubbles. 6. Put into oven and bake for 15 minutes. Reduce temperature to 130℃ and bake for another 30 minutes or until skewer comes out clean. Note that baking time will vary as each oven is different. Immediately invert to cool and carefully unmould by hand. 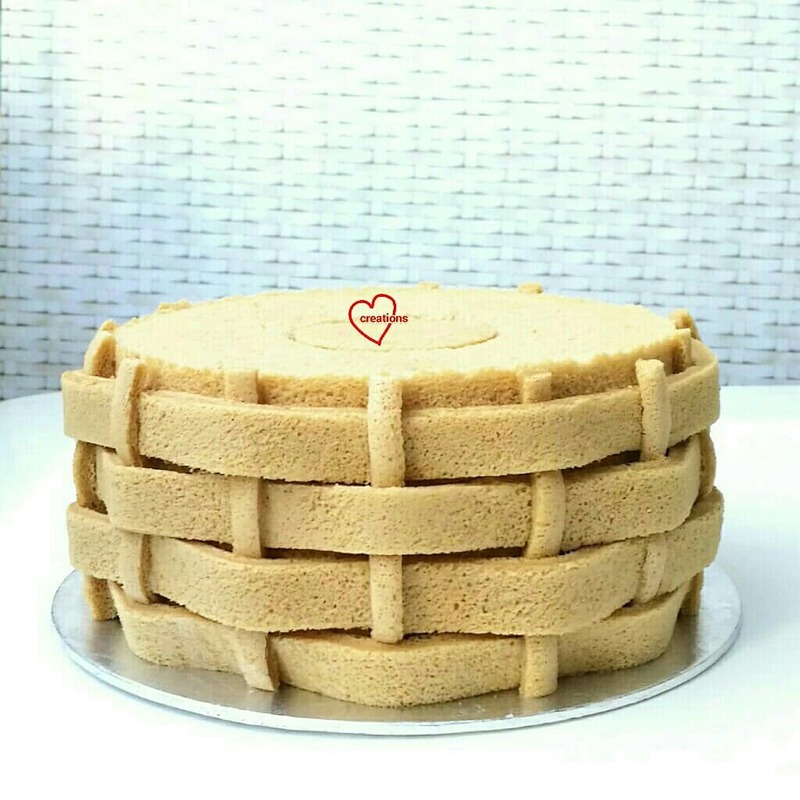 I used the same recipe to make some thin layer cakes to create the pieces for basket weave as well as to fill up the hole of the chiffon cake. I just randomly added on flowers and leaves on top, gluing all parts using melted marshmellows. It's nice to have a relatively relaxed and simple bake after a hectic week last week. Thank God for a smooth photoshoot and school hands-on event last week! 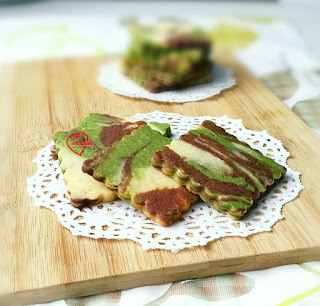 Presenting my version of marbled cookies with the flavours: Matcha, chocolate and vanilla! I adapted the recipe from the cream cheese cookie class that I conducted in June for kids as everyone at the class said it was really yummy. I prepared a large quantity of dough for each flavour here so feel free to scale it down. 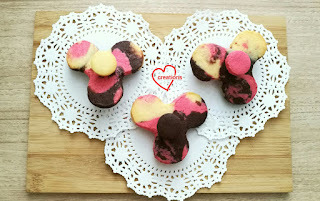 I discovered a method of creating the marbling effect of two or three different coloured/flavoured cookie dough in only two rounds of re-rolling the dough. 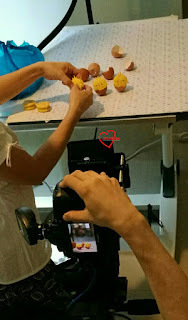 The more times you rework the dough by gathering it up and rolling it out again, the tougher the cookie can potentially become. So in order to keep the cookie texture delicate, rework your dough as little as possible. 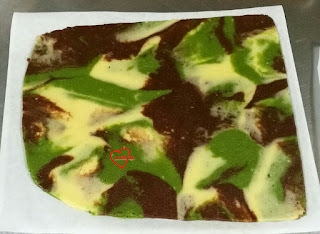 Unfortunately I will be teaching how to marble cookie dough in an upcoming class for Junior chef so I will be unable to share the technique of marbling in two simple steps. Perhaps some of you who are smart enough can figure it out 😉. You may knead the dough over and over to marble it but that's not what I did. I prepared three portions of the dough below, one for each flavour. 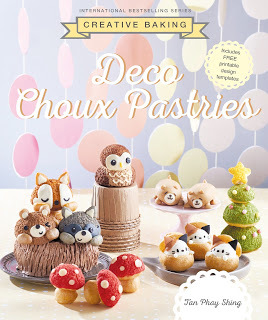 * Replace with 170g plain flour and 10g cocoa powder for chocolate dough. Replace with 172g plain flour and 8g bakeable Matcha powder for Matcha dough. The portions of cocoa and matcha powder I suggested is rather mild. Feel free to increase if you prefer stronger flavour. 1. Place cream cheese in large mixing bowl and mash it against the sides of the bowl with a spatula until it is softer. Add butter and mix the two together. Add salt and sugar and beat it with spatula or electric mixer until lighter in texture. 2. Gradually add egg and mix well after each addition. 3. 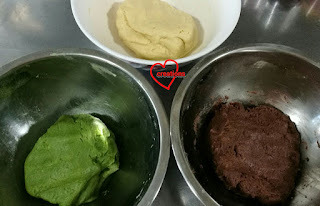 Add sifted flour or flour and cocoa/matcha in a few batches and mix well after each addition until a ball of dough forms. 4. Divide each coloured dough into 3 or 4 portions. Take one portion from each colour to create a marbled dough between two pieces of parchment paper. Repeat for the other portions. The reason why I divide each colour up is due to the large quantity here so it's easier to work with smaller portions each time. 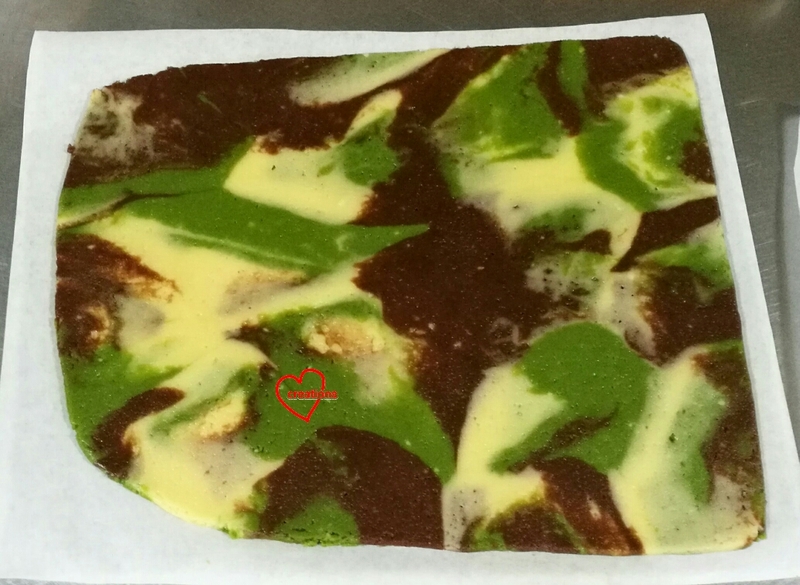 The marbled dough should be rolled to thickness of about 5-6mm. 5. Chill the dough in the freezer or fridge until firm before cutting out the dough. You may store the dough in the freezer for a few months in airtight condition. 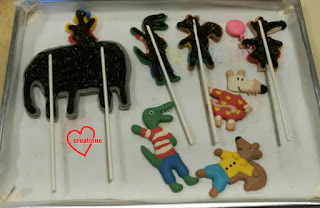 Let the dough soften at room temperature a little before stamping or cutting out the shapes. I used a scalloped square cookie cutter. You may use a knife to cut squares if you wish or any other shapes. 6. Place the cookie cutouts on baking tray lined with parchment paper with about 2cm spacing between cookies. The cookies won't expand much during baking so you can put the cutouts quite close to each other. 7. Bake in preheated oven at 160-170℃ on second lowest rack for 13-15 minutes or until slightly browned at bottom and edges. Note that baking time and temperature may vary as each oven is different. Use the slight browning visual cue as your gauge. Cool completely before storing. This is a Little Miss Chatterbox I made after my visit to the cutest new Mr Men, Little Miss Pop-up at Kumoya! Everything was so happy, I just couldn't stop smiling while I was there! =) Thank God the cake was very well-received too! I used the same Strawberry-Vanilla Chiffon Cake recipe here as my Super Mario (recipe in link). For the yellow hair, I just piped some yellow batter to the base of the bowl before adding the rest of the pink batter. 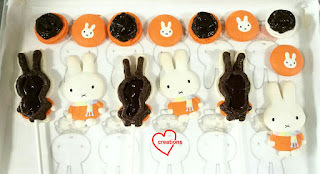 The hands, hair and feet are also made from chiffon cake batter in silicone cake pop molds (picture here). Have a happy, blessed week! This is another bake that I was working on during the busy period of preparing for the Creative Baking: Macaron Basics photoshoot. 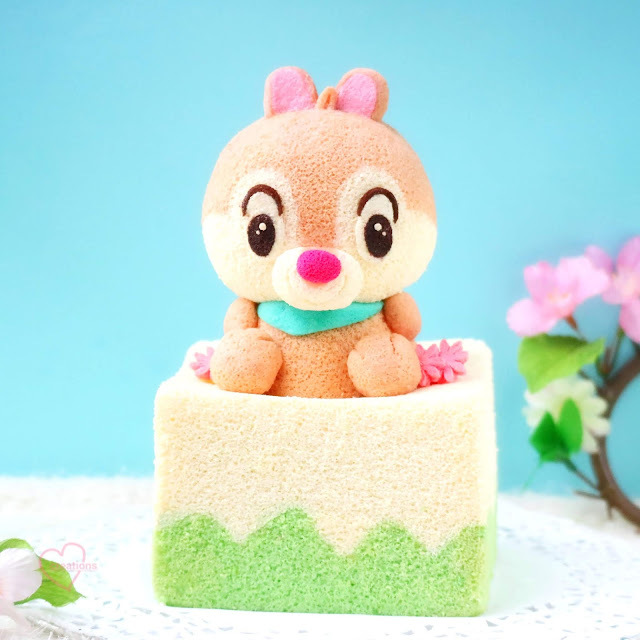 Vanilla chiffon cake with dark chocolate ganache in between and topped with Maisy and friends macaron cake toppers! 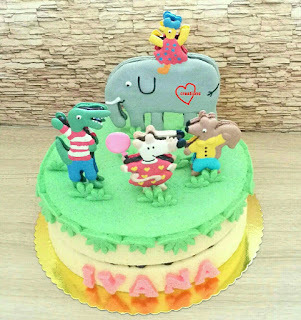 The class of 3 year old tots really enjoyed this cake! Here are a couple of pictures of the piping process...It was really challenging and I ended up working really late that night! I was working with 12 different coloured batters! 2. Prepare egg yolk batter. Whisk egg yolks with caster sugar until pale and thick. Add oil and mix until well combined. Add milk, vanilla and salt and whisk until well combined. Gradually sift in flour and whisk until no trace of flour is seen. 3. Prepare meringue. In a clean metal bowl, beat egg whites with cream of tartar until firm peaks form, gradually adding in caster sugar once the egg whites are foamy. 4. Quickly but gently fold in meringue into egg yolk batter in three additions. Divide the batter between the two pans equally. Run a chopstick in the batter to pop any air bubbles or gently tap the pans on the table. 5. 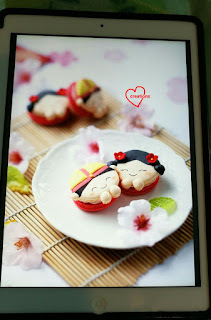 Bake for 5 minutes then reduce temperature to 150℃ and bake for another 15 minutes. 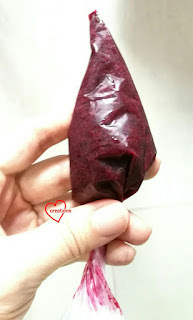 Reduce temperature to 130℃ and bake for another 20-25 minutes or until skewer comes out clean. Cool in the pan for 5 minutes before carefully unmoulding the cake from the sides of the pan by hand. I baked some thin chiffon sponge cakes for the simple decoration. As above but don't use steam baking. Bake at 160℃ for 11-12 minutes or until skewer comes out clean. Immediately flip the baked cakes out of the lined baking trays and gently peel off the parchment paper. Cool with parchment paper covering the cakes. I love the smooth look of the layer cakes! 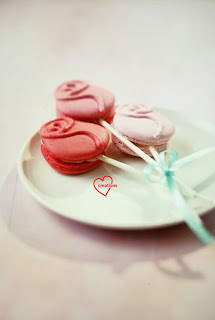 I filled the cakes with whipped dark chocolate ganache and the macarons with a firm dark chocolate ganache. You may use other fillings of your choice but this was requested. 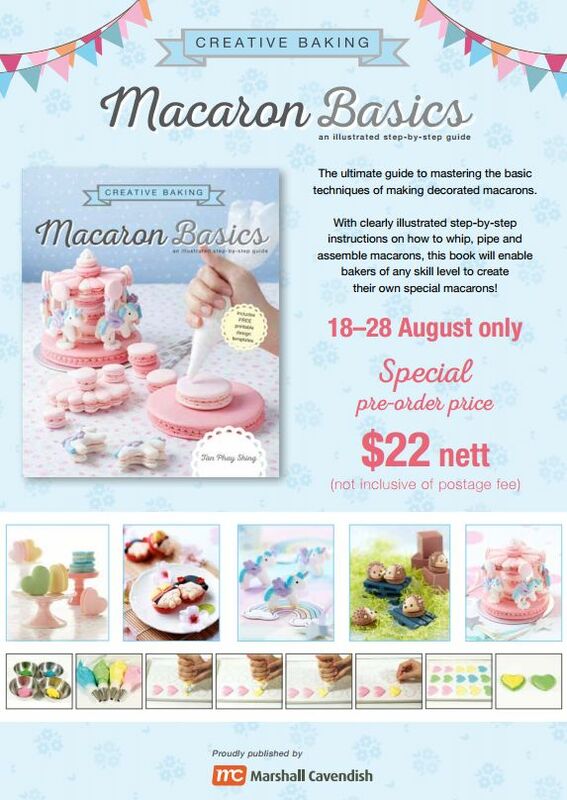 A firmer ganache is recommended as filling for the macaron cake toppers to prevent the toppers from sliding down the sticks in hot Singapore. 1. Place all ingredients in a microwave safe bowl or over a double boiler. Melt the chocolate for 20 seconds at medium power. Mix well with a spatula. Repeat heating and stirring until mixture is smooth and all chocolate has melted. 2. Chill in freezer for 2 minutes. Mix well with a spatula. Repeat chilling for 1-2 minutes and mixing until you are able to whip the mixture to be creamy-like. 3. Transfer to piping bag and fill the shells. To assemble, pipe a little ganache on the cakeboard. Place one vanilla sponge cake on. Pipe more whipped ganache before topping the cake with another vanilla sponge. 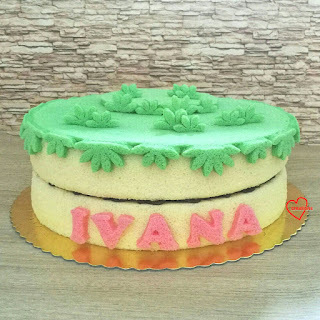 Decorate the cake with the green and pink sponge, using cookie cutters to cut out the alphabets and "grass". Glue them on with melted marshmellows. Thank God that overall it was really well received with the class of tots asking for second helpings. I was told there wasn't enough cake due to the extra helpings requested...Oops! I also made the mistake of forgetting to take the big cake out of the fridge much earlier as chocolate ganache takes a longer time to soften to room temperature than Swiss meringue buttercream or dairy cream. And it was an unusually cool rainy day that day, not your usual hot afternoon in Singapore. The dark chocolate ganache layer remained too firm as the cake was brought straight from the fridge in my house to party venue 😅. Another oops! Lesson learnt. I should either go for a lower chocolate to cream ratio or take the cake out of the fridge earlier next time. Or possibly both. 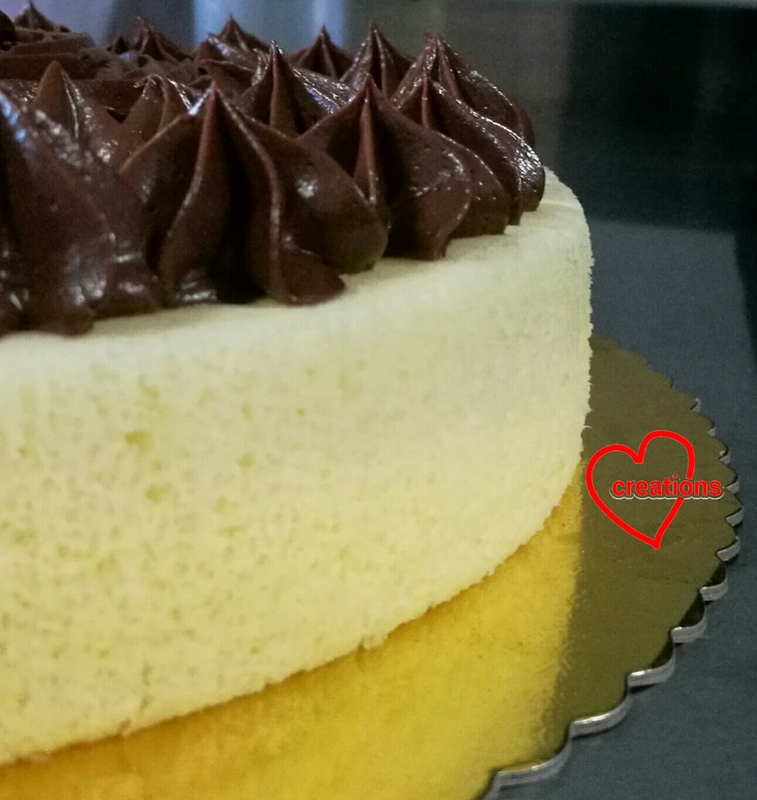 It's my first time filling a vanilla chiffon cake with dark chocolate ganache in between. I usually work with dairy cream or Swiss meringue buttercream where it is a concern that the filling stays firm long enough in hot Singapore where room temperature is about 28-29℃. Nevertheless, I am always happy to learn, and glad to know that the cake was yummy enough to warrant seconds!